News item: Super Bowl 53 sees 24 terabytes of Wi-Fi data used. 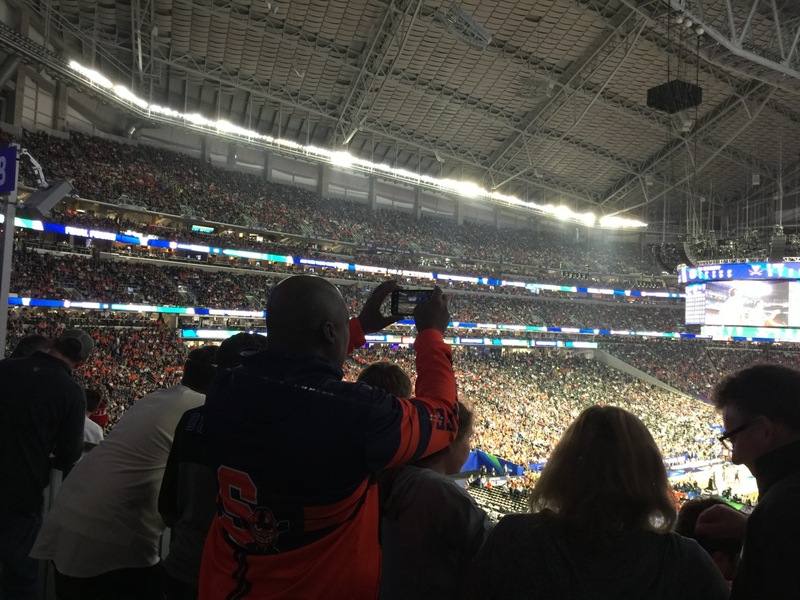 Second news item: Final Four weekend sees 31.2 terabytes of Wi-Fi data used. Even as people across the wireless industry seem ready to dig Wi-Fi’s grave, the view from here is not only is Wi-Fi’s imminent death greatly exaggerated, things may actually be heading in the other direction — Wi-Fi’s last-mile and in-building dominance may just be getting started. The latest ironic put-down of Wi-Fi came in a recent Wall Street Journal article with the headline of “Cellphone Carriers Envision World Without Wi-Fi,” in which a Verizon executive calls Wi-Fi “rubbish.” While the article itself presents a great amount of facts about why Wi-Fi is already the dominant last-mile wireless carrier (and may just get stronger going forward) the article doesn’t talk at all about the Super Bowl, where Verizon itself basically turned to Wi-Fi to make sure fans at the big game who were Verizon customers could stay connected. 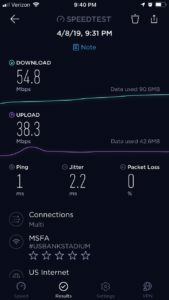 Wi-Fi speedtest from U.S. Bank Stadium during the Final Four championship game. As readers of MSR know, the performance of the cellular DAS at Mercedes-Benz Stadium in Atlanta has been a question mark since its inception, and the emergence of competing lawsuits between lead contractor IBM and supplier Corning over its implementation means we may never learn publicly what really happened, and whether or not it was ever fixed. Though stadium tech execs and the NFL said publicly that the DAS was fine for the Super Bowl, Verizon’s actions perhaps spoke much louder — the carrier basically paid extra to secure part of the Wi-Fi network bandwidth for its own customers, and used autoconnect to get as many of its subscribers as it could onto the Wi-Fi network. While we did learn the Wi-Fi statistics in detail — thanks to the fact that Wi-Fi numbers are controlled by the venue, not the carriers — it’s interesting to note that none of the four top cellular providers in the U.S. would give MSR a figure of how much cellular traffic they each saw in the stadium on Super Sunday. 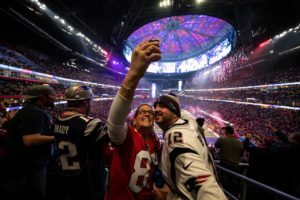 For the record, stadium officials said they saw 12.1 TB of data used on the Mercedes-Benz Stadium DAS on Super Bowl Sunday, a figure that represents the total traffic from all four carriers combined. But how that pie was split up will likely forever remain a mystery. AT&T did provide a figure of 23.5 TB for Super Bowl traffic inside the venue as well as in a 2-mile radius around the stadium, and Sprint provided a figure (25 TB) but put even a less-measurable geographic boundary on it, meaning Sprint could have basically been reporting all traffic it saw anywhere inside the greater Atlanta city limits. Verizon and T-Mobile, meanwhile, both refused to report any Super Bowl cellular statistics at all. 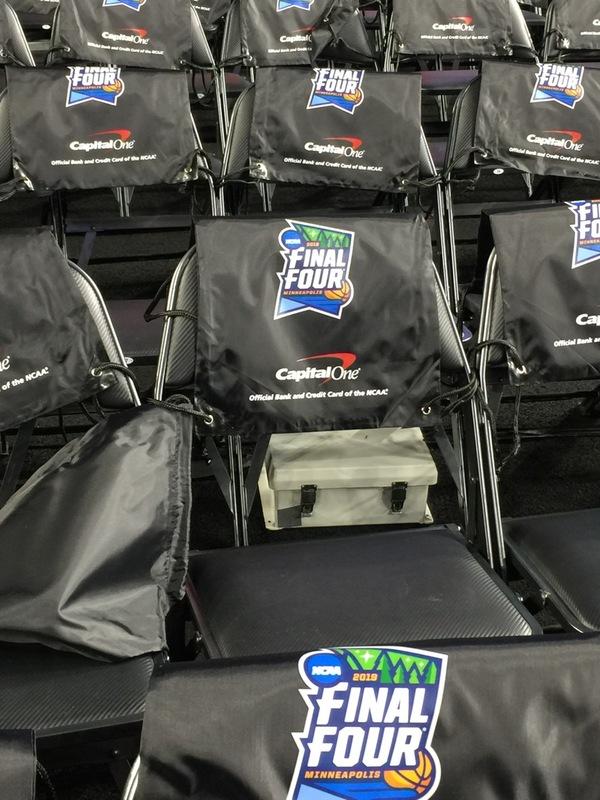 An under-seat Wi-Fi AP placement in the end zone seating at the Final Four. Verizon also did not reply to a question about how much traffic it saw on the Verizon-specific Wi-Fi SSID inside the venue. While we get the marketing reasons for not reporting disappointing stats (why willingly report numbers that make you look bad? ), it seems disingenious at best for one Verizon executive (Ronan Dunne, executive vice president and president of Verizon Wireless) to call Wi-Fi “rubbish” when another part of the company is relying heavily on that same rubbish technology to make sure its customers can stay connected when the cellular network can’t keep up. One man’s trash, I guess, is another division’s treasure. For venue owners and operators, the next few years are likely going to be filled with plenty of misinformation regarding the future of wireless. The big carriers, who pull in billions each quarter in revenue, are staking their near-term future on 5G, a label for a confusing mix of technologies and spectrum chunks that is unlikely to be cleared up anytime soon. Unlike the celluar industry change from 3G to 4G — a relatively straightforward progression to a new and unified type of technology — the change to 5G has already seen carriers willing to slap the marketing label on a different number of implementations, which bodes many headaches ahead for those in the venue space who have to figure out what will work best for their buildings and open spaces. There’s also the imminent emergence of networks that will use the CBRS spectrum at 3.5 GHz, which will support communications using the same LTE technology used for 4G cellular. Though CBRS has its own challenges and hurdles to implementation, because it is backed by carriers and the carrier equipment-supply ecosystem, you can expect a blitz of 5G-type marketing to fuel its hype, with poor old Wi-Fi often the target for replacement. While the Wi-Fi Alliance and other industry groups rallying around Wi-Fi might seem like the Rebel Alliance against a First Order dreadnought, if I’ve learned anything in my career of technology reporting it’s that you should never bet against open standards. I’ve been around long enough to see seemingly invincible empires based on proprietary schemes collapse and disappear under the relentless power of open systems and standards — like Ethernet vs. DEC or IBM networking protocols, and TCP/IP vs. Novell — to count out Wi-Fi in a battle, even against the cellular giants. 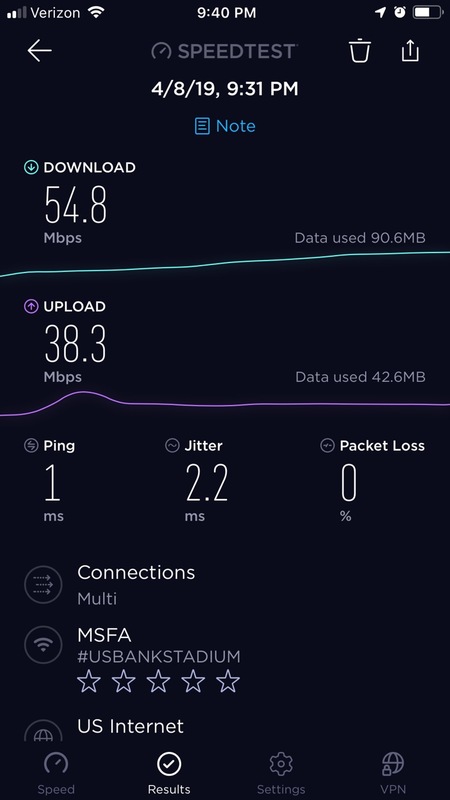 In fact, with the improvements that are part of Wi-Fi 6 — known also as 802.11ax in the former parlance — Wi-Fi is supposed to eventually become more like LTE, with more secure connections and a better ability to support a roaming connection and the ability to connect more clients per access point. What happens then if LTE’s advantages go away? With Wi-Fi 6 gear only now starting to arrive in the marketplace, proof still needs to be found that such claims can work in the real world, especially in the demanding and special-case world of wireless inside venues. But the same hurdles (and maybe even more) exist for CBRS and 5G technologies, with big unanswered questions about device support and the need for numerous amounts of antennas that are usually ignored in the “5G will take over the world soon” hype stories. I’d also add to that mix my wonder about where the time and talent will come from to install a whole bunch of new technologies that will require new learning curves; meanwhile, as far as I can tell the companies supporting Wi-Fi continue to add technology pros at ever-growing user and education conferences. So as we ready for the inevitable challenge of sifting through cellular FUD and hype let’s have a cheer for good old Wi-Fi — for now the champion of the biggest data-demand days in venues, and maybe the leader for years to come. Super Bowl 53 at Atlanta’s Mercedes-Benz Stadium rewrote the record book when it comes to single-day stadium Wi-Fi, with 24.05 terabytes of traffic seen on the stadium’s network. That is a huge leap from the official 16.31 TB seen at last year’s Super Bowl 52 in Minneapolis at U.S. Bank Stadium. 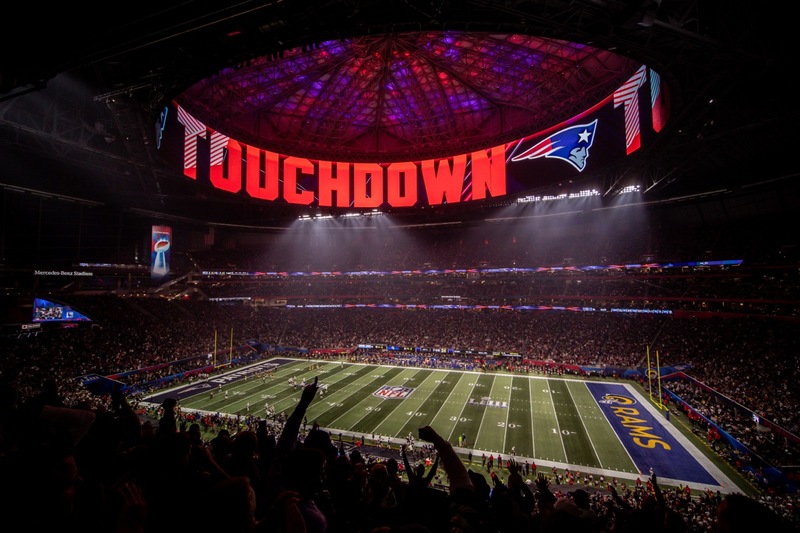 According to official statistics provided by Extreme Networks, new high-water marks were set last Sunday in every category of network measurement, including an amazing 48,845 unique users on the network, a take rate of 69 percent out of the 70,081 who were in attendance to watch the New England Patriots beat the Los Angeles Rams 13-3. The average Wi-Fi data use per connected fan also set a new record, with the per-fan mark of 492.3 megabytes per user eclipsing last year’s mark of 407.4. While fans might have preferred some more scoring excitement during the game, the lack of any tense moments in network operations was a perfect outcome for Danny Branch, chief information officer for AMB Sports & Entertainment. “I was ecstatic on how [the network] executed, but honestly it was sort of uneventful, since everything went so well,” said Branch in a phone interview the week after the game. Though network performance and fan usage during some of the big events leading up to the Super Bowl had Branch thinking the Wi-Fi total number might creep near the 20-terabyte range, the early network use on game day gave Branch a clue that the final number might be even higher. Editor’s note: This report is from our latest STADIUM TECH REPORT, an in-depth look at successful deployments of stadium technology. Included with this report is a profile of the new Wi-Fi and DAS networks being planned for the University of Colorado, as well as a profile of Wi-Fi at Little Caesars Arena in Detroit! DOWNLOAD YOUR FREE COPY now! Digital device use once again set records at the NFL’s championship game. With some 1,800 APs installed inside Mercedes-Benz Stadium — with most of the bowl seating APs located underneath the seats — the Wi-Fi gear from Aruba, a Hewlett Packard Enterprise company, in a design from AmpThink, also saw a peak throughput rate of 13.06 Gbps, seen at halftime. The peak number of concurrent network users, 30,605, also took place during the halftime show, which featured the band Maroon 5 (whose show played to mixed reviews). Need proof that people still watch the game? Out of the 24.05 TB total, Extreme said 9.99 TB of the traffic took place before the kickoff, followed by 11.11 TB during the game and halftime, and another 2.95 TB after the game concluded. On the most-used apps side, Extreme said the most-used social apps were, in order of usage, Facebook, Instagram, Twitter, Snapchat and Bitmoji; on the streaming side, the most-used apps were iTunes, YouTube, Airplay, Spotify and Netflix. The most-used sporting apps by fans at the game were, in order, ESPN, NFL, the Super Bowl LIII Fan Mobile Pass (the official app for the game), CBS Sports (which broadcast the game live) and Bleacher Report. Did Verizon’s offload spike the total? While Super Bowl Wi-Fi traffic has grown significantly each year since we started reporting the statistics, one reason for the bigger leap this year may have been due to the fact that Verizon Wireless used its sponsorship relationship with the NFL to acquire its own SSID on the Mercedes-Benz Stadium Wi-Fi network. Hard copy signage in the stadium helped direct fans to the Wi-Fi. According to Andrea Caldini, Verizon vice president for networking engineering in the Eastern U.S., Verizon had “autoconnect in play,” which meant that any Verizon customer with Wi-Fi active on their devices would be switched over to Wi-Fi when inside the stadium. “It’s going to be a good offload for us,” said Caldini in a phone interview ahead of the Super Bowl. While Verizon claimed week to have seen “record cellular traffic” as well during Super Bowl Sunday, a spokesperson said Verizon will no longer release such statistics from the game. 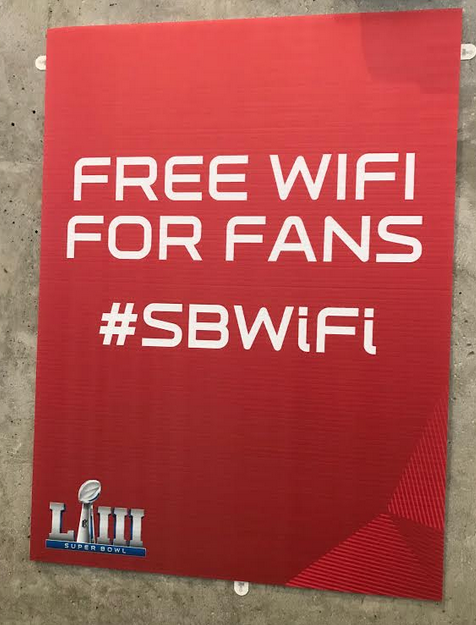 According to Branch, the NFL helped fans find the Wi-Fi network with additional physical signage that was put up just for the Super Bowl, in addition to rotating messages on the digital display screens around the stadium. “The venue was well signed, we really liked what they [the NFL] did,” Branch said. 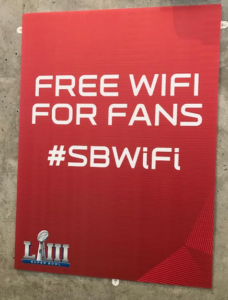 Branch said the league also promoted the Wi-Fi link throughout the week, with a common ID at all the related Super Bowl activity venues, something that may have helped fans get connected on game day. One of the parts of the wireless mix at Mercedes-Benz Stadium, the cellular distributed antenna system, was under scrutiny after a lawsuit emerged last fall under which technology supplier IBM sued Corning over what IBM said was faulty installation. While Corning has disputed the claims, over the past year IBM, the Falcons and the NFL all said they got the DAS in working order, and according to Branch “all the carriers were pleased” with its operation during the Super Bowl. There was only one, but it helped increase the wireless traffic. According to Branch, the Falcons saw 12.1 TB of traffic on the in-stadium DAS on Super Bowl Sunday, including some traffic that went through the Matsing Ball antennas. Branch said the two Matsing Balls, which hang from the rafters around the Halo Board video screen, were turned back on to assist with wireless traffic on the field during the postgame awards ceremony. Overall, the record day of Wi-Fi traffic left Branch and his team confident their infrastructure is ready to support the wireless demands of more big events into the future, including next year’s NCAA men’s Final Four. 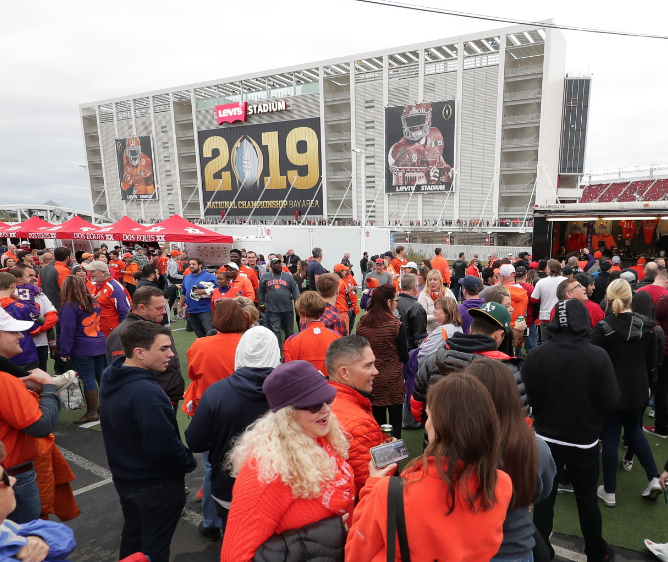 Fans and media members at Monday night’s College Football Playoff championship game used a total of 5.1 terabytes of data on the Wi-Fi network at Levi’s Stadium, according to figures provided by the San Francisco 49ers, who own and run the venue. With 74,814 in attendance for Clemson’s 44-16 victory over Alabama, 17,440 of those in the stands found their way onto the stadium’s Wi-Fi network. According to the Niners the peak concurrent connection number of 11,674 users was seen at 7:05 p.m. local time, which was probably right around the halftime break. The peak bandwidth rate of 3.81 Gbps, the Niners said, was seen at 5:15 p.m. local time, just after kickoff. In a nice granular breakout, the Niners said about 4.24 TB of the Wi-Fi data was used by fans, while a bit more than 675 GB was used by the more than 925 media members in attendance. The Wi-Fi data totals were recorded during an 8-1/2 hour period on Monday, from 1 p.m. to 9:30 p.m. local time. Added to the 3.7 TB of DAS traffic AT&T reported inside Levi’s Stadium Monday night, we’re up to 8.8 TB total wireless traffic so far, with reports from Verizon, Sprint and T-Mobile still not in. 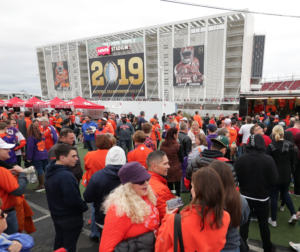 The top Wi-Fi number at Levi’s Stadium, for now, remains Super Bowl 50, which saw 10.1 TB of Wi-Fi traffic. That question gets an interesting answer with the lead profile in our most recent STADIUM TECH REPORT, the Winter 2018-19 issue! These quarterly long-form reports are designed to give stadium and large public venue owners and operators, and digital sports business executives a way to dig deep into the topic of stadium technology, via exclusive research and profiles of successful stadium technology deployments, as well as news and analysis of topics important to this growing market. 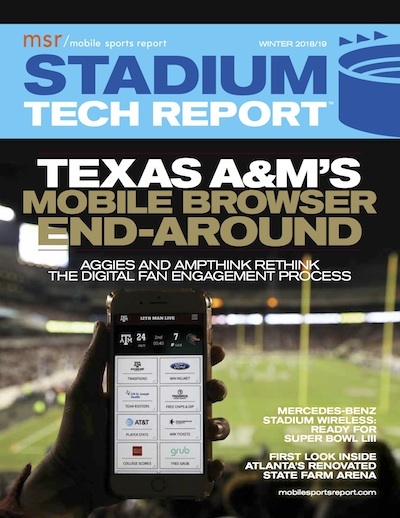 Leading off for this issue is an in-depth report on a new browser-based digital game day program effort launched this football season at Texas A&M, where some longtime assumptions about mobile apps and fan engagement were blown apart by the performance of the Aggies’ new project. A must read for all venue operations professionals! We also have in-person visits to Atlanta’s Mercedes-Benz Stadium and the renovated State Farm Arena, the venue formerly known as Philips Arena. A Q&A with NFL CIO Michelle McKenna-Doyle and a report on a CBRS network test by the PGA round out this informative issue! DOWNLOAD YOUR REPORT today! We’d like to take a quick moment to thank our sponsors, which for this issue include Mobilitie, JMA Wireless, Corning, Huber+Suhner, Boingo, Oberon, MatSing, Neutral Connect Networks, Everest Networks, and ExteNet Systems. Their generous sponsorship makes it possible for us to offer this content free of charge to our readers. We’d also like to welcome readers from the Inside Towers community, who may have found their way here via our ongoing partnership with the excellent publication Inside Towers. We’d also like to thank the SEAT community for your continued interest and support. As always, we are here to hear what you have to say: Send me an email to kaps@mobilesportsreport.com and let us know what you think of our STADIUM TECH REPORT series. 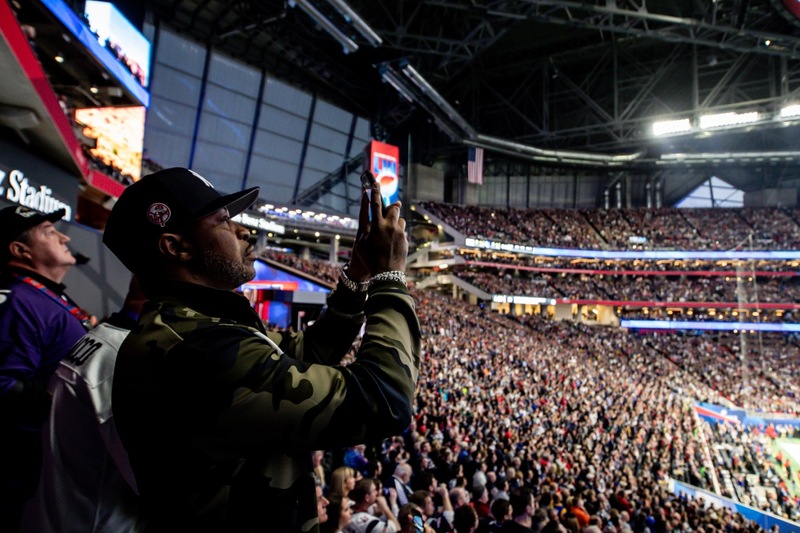 The Wi-Fi network at Atlanta’s Mercedes-Benz Stadium saw 12 terabytes of data used at the 2018 College Football Playoff championship on Jan. 8, 2018, according to officals from the Atlanta Falcons, owners and operators of this city’s new distinctive venue. 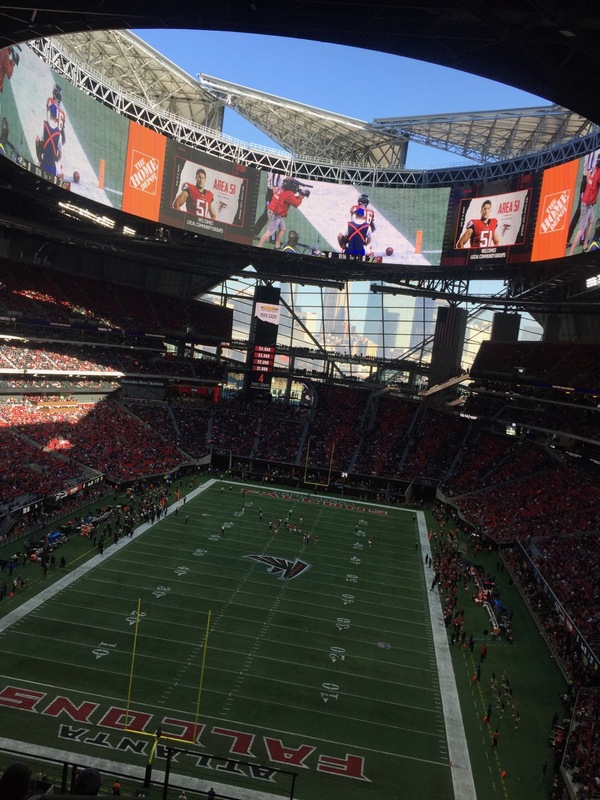 We’d long suspected that Mercedes-Benz Stadium, which opened in August of 2017, had seen big data days inside the 71,000-seat arena with its innovative technology, but until Sunday the Falcons had never made any network-performance data publicly available. 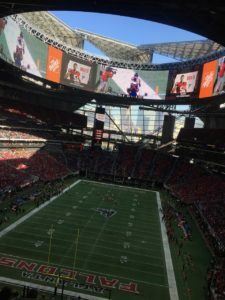 But a day after the venue saw another 8.06 TB of Wi-Fi used during the SEC Championship game, Danny Branch, chief information officer for AMB Sports & Entertainment, revealed the statistics during a live MSR visit at an Atlanta Falcons home game. The 12 TB mark (which was an estimate — we’ll check back with the Falcons for exact numbers) is the second-highest we’ve ever seen in our unofficial research of single-day Wi-Fi totals, trailing only the 16.31 TB recorded at Super Bowl LII in February at U.S. Bank Stadium. “We’re confident and ready for the Super Bowl,” said Branch during a pregame stadium tour, details of which we’ll dig into deeper in a full profile for our upcoming Winter Stadium Tech Report. Multiple network speed tests taken by MSR during Sunday’s 26-16 Falcons loss to the visiting Baltimore Ravens showed robust Wi-Fi performance on the network that uses gear from Aruba, a Hewlett Packard Enterprise company, in a design from AmpThink. According to Branch, the cellular distributed antenna system (DAS) network inside Mercedes-Benz — a deployment that is at the center of a current lawsuit filed by contractor IBM against gear supplier and designer Corning — is also now at full deployment, with the completion of 700 new under-seat DAS antenna deployments, mostly in the upper seating deck. MSR speed tests taken during Sunday’s game showed a wide range of DAS results, from single-digit tests in some tough-deployment areas to results near 100 Mbps directly in front of what looked like some new antenna deployments. Again, look for more details in our upcoming profile in the Winter Stadium Tech Report (due out in mid-December). “We’re in a good place [with the DAS],” said Branch, though he did say there was going to be more DAS work done on the outside of Mercedes-Benz Stadium prior to when Super Bowl LIII comes to the venue on Feb. 3, 2019, mainly to help ensure that the move toward more digital Super Bowl tickets goes smoothly. Mercedes-Benz Stadium also now has a couple of MatSing ball antennas in its rafters, there to bring DAS coverage to the sidelines of the playing field. Sunday the Mercedes-Benz Stadium staffers were hosting a rare big-game back-to-back event, following Saturday’s packed-house tilt between SEC powers Alabama and Georgia, a championship-game rematch won by Alabama 35-28 after a dramatic comeback. “That was a massive flip,” said Branch of the two-day stretch, which saw another huge data day Saturday with 8.06 TB of Wi-Fi used. The network, sponsored by backbone provider AT&T, averages about a 50 percent take rate from event attendees, according to Branch, who gave praise to Aruba and AmpThink for their combined deployment efforts. 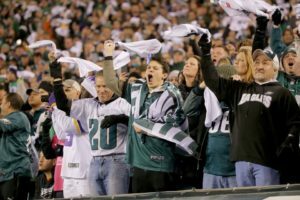 The Philadelphia Eagles saw 8.76 terabytes of Wi-Fi data used at Lincoln Financial Field on Jan. 21 during the Eagles’ 38-7 win over the Minnesota Vikings in the NFC Championship game, a new high in one-day Wi-Fi usage for reported marks in games not called the Super Bowl. Though the game’s position as No. 3 on our unofficial “top Wi-Fi” list (see below) may change as we get reports from other recent NFL playoff games, the mark is nevertheless impressive, and perhaps a big confirmation metric for Panasonic’s nascent big-venue Wi-Fi business. 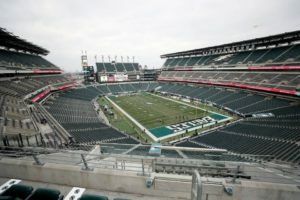 According to Panasonic, its 654-Access Point network inside “The Linc” also saw 35,760 unique connections during the game, out of 69,596 in attendance; the network also saw a peak of 29,201 concurrent devices connected (which happened during the post-game trophy presentation), and saw peak throughput of 5.5 Gbps. 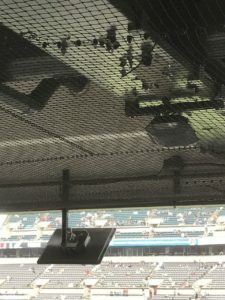 What’s most interesting about the new Panasonic network in Philadelphia is that it is a completely top-down deployment, meaning that most of the APs (especially the 200 used in the seating bowl) shoot signals down toward seats from above. While most new networks at football-sized stadiums (and some smaller arenas) have turned to under-seat or railing-mounted APs to increase network density in seating areas, Panasonic claims its new “Everest” Wi-Fi gear has antennas that can provide signals up to 165 feet away, with “electronically reconfigurable directional beam profiles” that allow for specific tuning of where the Wi-Fi signal can point to. By also putting four separate Wi-Fi radios into each access point, Panasonic also claims it can save teams and venues money and time on Wi-Fi deployments, since fewer actual devices are needed. By comparison, other big, new network deployments like Notre Dame’s often have a thousand or more APs; Notre Dame, which uses railing-mounted APs in the seating bowl, has 685 in the seating bowl out of a total 1,096 APs. Many of the Notre Dame APs are Cisco 3800 devices, which have two Wi-Fi radios in each AP. 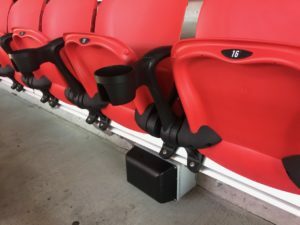 Atlanta’s new Mercedes-Benz Stadium, which uses Aruba Wi-Fi gear mainly deployed under seats in the bowl, has nearly 1,800 APs, with 1,000 of those in the seating bowl. From a design and performance standpoint, the under-seat or railing-mounted “proximate” networks are built with many APs close together, with the idea that fans’ bodies will intentionally soak up some of the Wi-Fi signal, a fact that network designers use to their advantage to help eliminate interference between radios. The under-seat AP design, believed to be first widely used by AT&T Park in San Francisco and then at a larger scale at Levi’s Stadium in Santa Clara, Calif., was developed to help bring better signals to seats where overhang-mounted APs couldn’t deliver strong connectivity. Older concrete-bowl stadiums like Notre Dame’s also went with a proximate railing design for a similar lack of overhangs. Though the Eagles’ IT team has repeatedly turned down interview requests from MSR since this summer, Danny Abelson, vice president connectivity for Panasonic Enterprise Solution Company, met with MSR last week to provide details of the deployment. Citing new, patented antenna technology developed specifically by Panasonic to solve the limitations of prior overhead gear, Abelson claims Panasonic can deliver a similar stadium experience for “two-thirds the cost” of an under-seat or railing-mount network design, with savings realized both in construction costs (since it is usually cheaper to install overhead-mounted equipment than under-seat or railing mounts due to drilling needed) and in the need for fewer actual APs, since Panasonic has four radios in its main Wi-Fi APs. 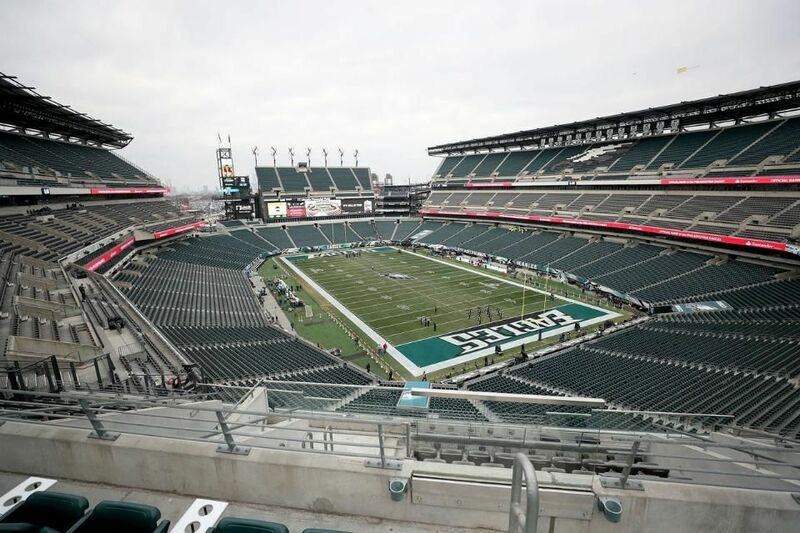 Abelson, however, declined to provide the exact cost of the Panasonic network at Lincoln Financial Field, citing non-disclosure agreements. There are also more questions to be answered about a Panasonic deployment’s cost, including charges for management software and/or administration services. Currently, Abelson said, Panasonic includes the costs for management software and management personnel in its bids. When it comes to how the Eagles found Panasonic, the team and the company already had an existing relationship, as Panasonic’s video-board division had previously supplied displays for the Linc. 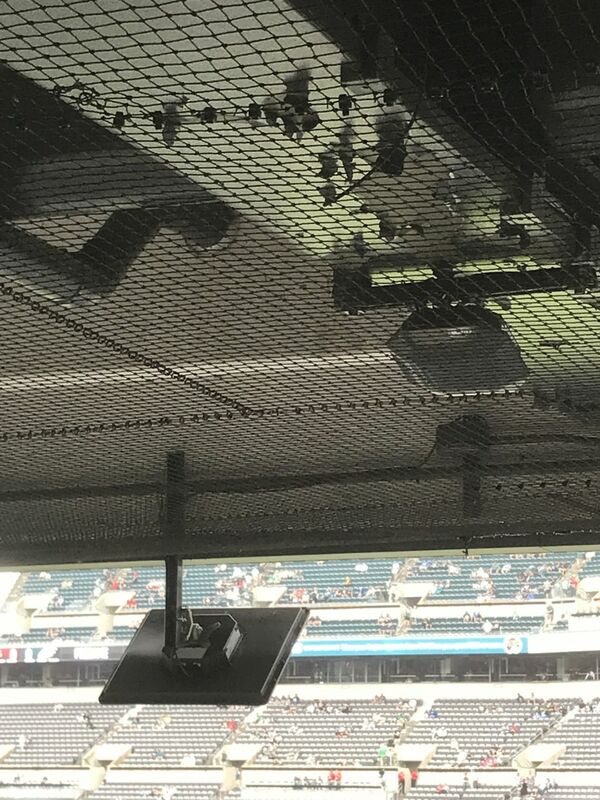 According to Abelson, Panasonic went through a performance test at several Eagles games last season, bringing in Wi-Fi gear to see if the new technology could provide coverage to areas where the Eagles said they had seen lower-quality coverage before. One of the forerunners in the NFL in bringing Wi-Fi to fans, the Eagles had previously used Extreme Networks Wi-Fi gear to build a fan-facing network in 2013. Though the Eagles would not comment about the selection process, after issuing an RFP this past offseason the team chose Panasonic for a new network, which Abelson said was deployed in three months during the football offseason. Re-opening the debate for antenna placement? Though Mobile Sports Report has not yet been able to get to Philadelphia to test the new network in a live game-day situation, if Panasonic’s new gear works as promises the company may find many potential interested customers, especially those who had shied away from deploying under-seat networks due to the construction issues or costs. So far this season, we haven’t gotten any reports of Wi-Fi usage out of the network team at Atlanta’s Mercedes-Benz Stadium (which recently hosted the college football playoff championship game), and we’ve only heard general talk about oversized playoff-game traffic at U.S. Bank Stadium in Minneapolis, home of Sunday’s Super Bowl 52. Like Notre Dame Stadium, U.S. Bank Stadium uses a mostly railing-mounted AP deployment in its seating bowl; both networks were designed by AmpThink. We are also still waiting for reports from last week’s AFC Championship game at Gillette Stadium, where the previous non-Super Bowl top mark of 8.08 TB was set in September; and from any games this fall at AT&T Stadium in Arlington, Texas, where the NFL’s biggest stadium has 2,567 Wi-Fi APs. Will overhead still be able to keep up as demand for more bandwidth keeps growing? Will Panasonic’s claims of lower costs for equal performance hold up? At the very least, the performance in Philadelphia could re-open debate about whether or not you need to deploy APs closer to fans to provide a good Wi-Fi experience. If all goes well, the winners in renewed competition will be venues, teams, and ultimately, fans.